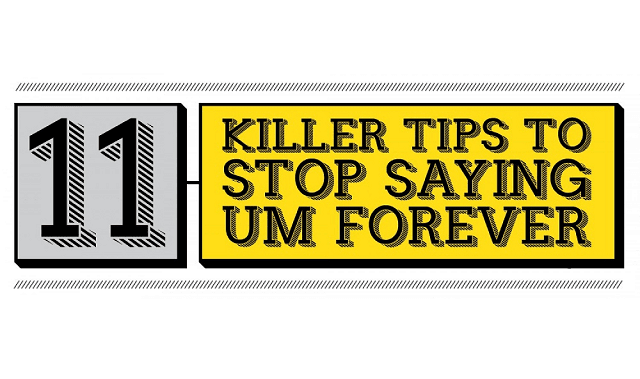 11 Killer Tips to Stop Saying ‘Um’ Forever #infographic ~ Visualistan '+g+"
Many of us are too afraid to speak. For some reasons of which not everybody knows, we tend to fall back every time we are told to do so. It could even lead us more to death to speak before the crowd than encounter a car accident. It is always the hardest test for most people, the reason why we fail to acquire proper and good communication with others. Every time we are tasked to say something, we immediately see ourselves the ‘what ifs’ the moment we deliver our words. So, we leave ourselves tongue-tied, and even become the source of laughing stock or gossips from the audience. We cram, perspire, shake, and think right away that we are attacked, then eventually we feel self-pity.